Hi, I am interested in your 1960 Chevrolet Corvair (stock #WWVA568.KT) listed on Autotrader for $12,900. I'd like to get more information about this vehicle and confirm its availability. 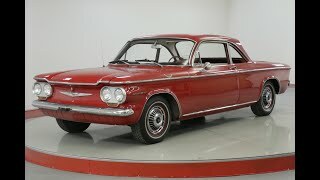 The Chevrolet Corvair is a compact car manufactured by Chevrolet for model years 1960 1969 across two generations. As the only American-designed, mass-produced passenger car with a rear-mounted, air-cooled engine, the Corvair was manufactured and marketed in two-door coupe, convertible, four-door sedan, four-door station wagon, passenger van, commercial van, and pickup truck body styles in its first generation (1960-1964) as well as two-door coupe, convertible and four-door sedan in its second generation (1965-1969).